Hexagon tiles are a hot item right now and hexagon shaped floor tile trends are definitely setting the pace for home designers around the country. At Conestoga Tile, we carry a number of hexagon shaped tiles for you to select from so that you can enjoy the beautiful designs these tiles can create. Dolce Vita Castello Range – These Italian inspired tiles are available in 5 colors and a multitude of sizes which makes incorporating them into entryways, bathrooms, or kitchens a breeze. Strong and durable, they can be used in the home or the office. Mediterranea Chicago – If modern design is your dream, then this is the foundation of that vision. Mediterranean Chicago tiles are vibrant and ideal for setting the tone. Solid and durable, it’s one of our most popular porcelain tile lines. 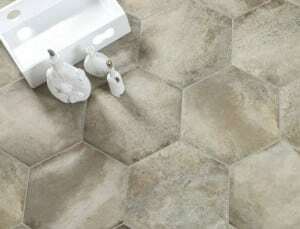 For more information about hexagon shaped floor tile trends and the products we offer, contact Conestoga Tile for more details.